Luke Rockhold (pictured) found himself on the business end of a highlight reel finish in his UFC debut. 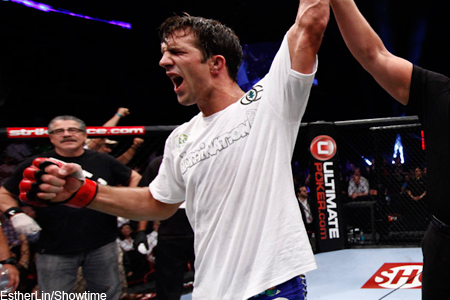 The former Strikeforce middleweight champion will now look to right the ship when he battles Tim Boetsch at UFC 166. Brett Okamoto of ESPN.com first reported the shootout early Wednesday morning. The October 21 event takes place inside Toyota Center in Houston, Texas. Rockhold’s nine-fight winning streak came to an abrupt halt when he attempted to block Victor Belfort’s spinning heel kick with his face in May at UFC on FX 8. The 28-year-old owns a respectable 10-2 professional record. Boetsch is looking to rebound from back-to-back losses. After rattling off four straight wins inside the Octagon, “The Barbarian” has since dropped bouts to Costa Philippou and last month to Mark Munoz. The 185-pound affair will likely appear on the main card.